Ignore the naysayers. The OSR is one of the most caring and giving communities to be found. Anywhere. By my calculations, readers of The Tavern raised at least $625 for Mona Dowie's cancer related expenses. I'm sure I missed some donations and more will be coming in the future. I had initially offered to match the first $250 raised by Tavern Readers. Tom Tullis / Fat Dragon Games and Tim Riley together matched my match - we now had $500 in matching funds and the community just blew us away by donating over $600. I can't tell you how proud I am to be a member of the OSR and the community that has grown around The Tavern. You folks literally are the best. 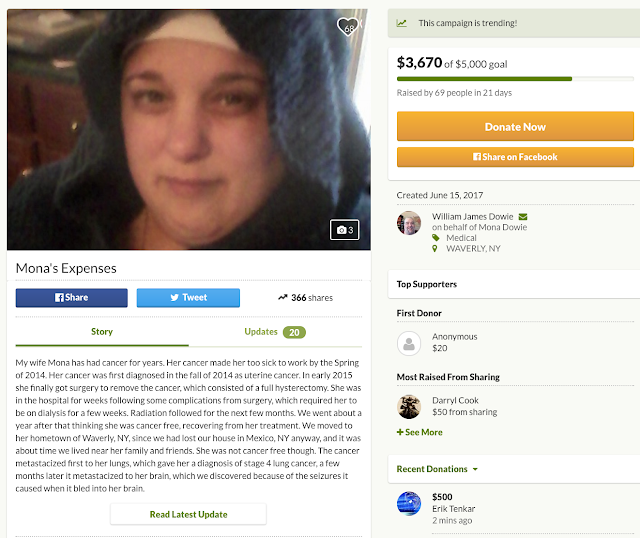 Mona's GoFundMe can be found here. Just because we met out matching goal doesn't mean Mona and her family no longer need support. They do.